At High Range, we are committed to preserving the working function of the Jack Russell. What a thrill to watch these dogs do what their instincts drive them to do! Hunting underground is the wellspring from which the Jack Russell originates. Even if you want a Jack Russell soley as a pet, it is important to understand the dog's hunting heritage. 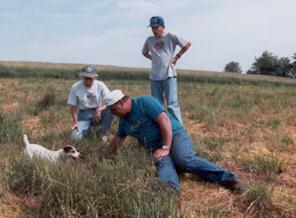 From this working wellspring, comes the JRT's need for exercise, firm training and interaction. With radio collar on and shovels at hand, Tip is ready for day in the field in Maryland. Tip worked well and earned her Natural Hunting Certificate to Groundhog. The working Jack Russell has genuine true grit. This terrier's courage and tenacity have no bounds. 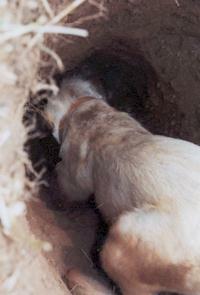 The physical structure, mind and temperament of the JRT stem from the dog's original job to enter the underground dens of quarry, especially the red fox. Working your Jack Russell does involve risk. We urge great caution. Begin fieldwork only with experienced people. We thank Chuck Hufnagel for all he taught us. In Maryland with our cherished friend, the late Chuck Hufnagel. 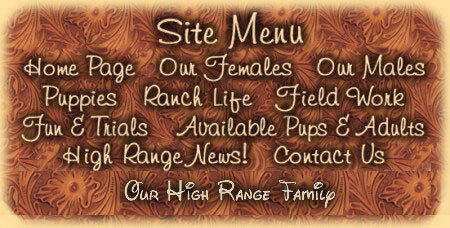 We work our terriers only with people who know their hunting environment. TERRIER AT WORK! 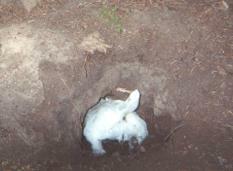 Here Tip is four feet underground sparring with a groundhog. We have carefully dug an observation or 'peep' hole to watch her work. If the terrier does not bolt the quarry, we dig to the terrier. This was a relatively easy dig to four feet. We have friends who have dug fifteen feet to their terriers. 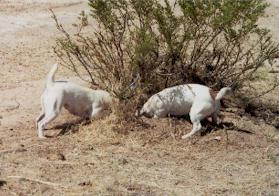 The Jack Russell's distinctive skill is to "hold" not engage or harm the quarry. Tip held this groundhog very well by sparring up close. as well as the dog. Beau says it is even more fun than fishing! 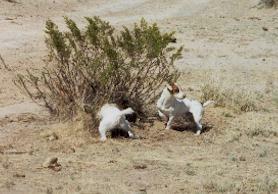 The JRTCA breed standard comes alive when you watch your dog maneuver in an earth. Flexibility and a small spann are critical. Here Tip turns herself into a small ball in order to permit passage at the tight opening of an earth. Here can be seen the importance of a small, flexible span on the dog. Span is the diameter of the chest immediately behind the shoulders. The size and flexibility of the span determine how small an underground passage through which the dog can move. Not exactly underground but a den in the side of a rock cliff in Wyoming. Here Welsh houndsman and terrierman David Jones help us dig out. Terriers can go "in" areas where you do not plan for them to go! Shine readied to enter a groundhog earth in Georgia. Note her radio collar. Always use an electronic finder and radio collar when hunting. This equipment will determine the depth and location of your dog. In Colorado, Luke checks out what appears to be a fox earth. Here Luke goes on into the earth. Perhaps everything is bigger in Texas. 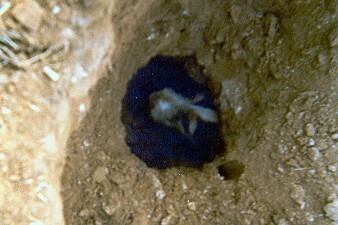 Here Whitey exits a grey fox earth on a neighboring ranch with an opening as big as a dog house. Note Whitey's big head and strong jaws. The JRT's head is the first line of defense when facing quarry underground. Determination, strength and athletic skill! In Colorado, here Tip maneuvers through a small opening to a marmite earth by furious digging, scratching and shrinking herself to the width of an envelope! "A terrier belonging to the Essex Union Hunt went down an earth after a fox at Ongar and did not return. For six days, diggers tried to locate it and at last succeeded. The exhausted terrier was given brandy and milk to revive it. Then it tried to get back in the earth again." "Terrier" from the latin word "terra" meaning "of the earth." Without a doubt, the Jack Russell is "of the earth."